I haven’t posted in a while, life happened, or more directly watching sport happened. On Sunday 6th July the slopes of Holme Moss was something to see. Thousands were on the slopes of the hill, and it was an entertainment in itself watching others arrive. A woman dressed as a banana was jogging up the hill when a man dressed as a gorilla jumped out of the crowd and chased her down the hill. Several people in Morph suits had either walked or cycled up. A panda walked passed and Sonic the Hedgehog, a large round costume, somehow managed to ride a bike up the gradient. A while Mexican waves were going up and down the hill. Then five helicopters flew over and landed in the field below. I wonder who was in them. The reason for all this madness was a bike race. People turned out in their thousands to see the Tour de France run through Yorkshire. There is another day in the UK before the race actually starts touring France. Yorkshire had bid to be the place of the Grand Depart, so the race which bills itself as the worlds greatest annual sporting event rolled in to the County. In Leeds, the city of the Grand Depart, There was a parade of the cyclists through the streets on Thursday before the Tour started on Saturday. Saturday, the day started with a parade of the Caravan, the official vehicles of the race together with sponsors vehicles, often throwing free goods, from tea to sweets to oven chips, out to the crowd. The police had a good vantage point, and used it by taking photos for people waiting for the cyclists to pass. Our day started with the train to Leeds, and to our surprise it was an old diesel locomotive and historic carriages. The train spotters were out, easily recognised by the unofficial uniform of anoraks and bobble hats even in summer. But that is an aside. Back to the tour. Leeds was packed. People were thronging towards the start, walking along closed roads which were once full of buses and were now full of pedestrians. A bacon butty later and we were in place to see the start. But first the parade. The cyclists came through at less than racing speed, the start was not yet, they were on route to Harewood House where the race would be started again, by royalty, the Duke and Duchess of Cambridge were there, so they stopped the race in order to start it. But we were in Leeds. we returned home to watch the finish on TV. Then Sunday. On our separate ways. Linda and Matthew watched from Blackley, a short walk from home, I cycled the 12 miles to Holme Moss to see the race travelling slower on the inclines. Even then the actual cycling was over fairly quickly, they don’t hand around, even when going up hill. Still it was a good day. The bonus was I got a wave from Bernard Hinault as the race officials came past in their cars. 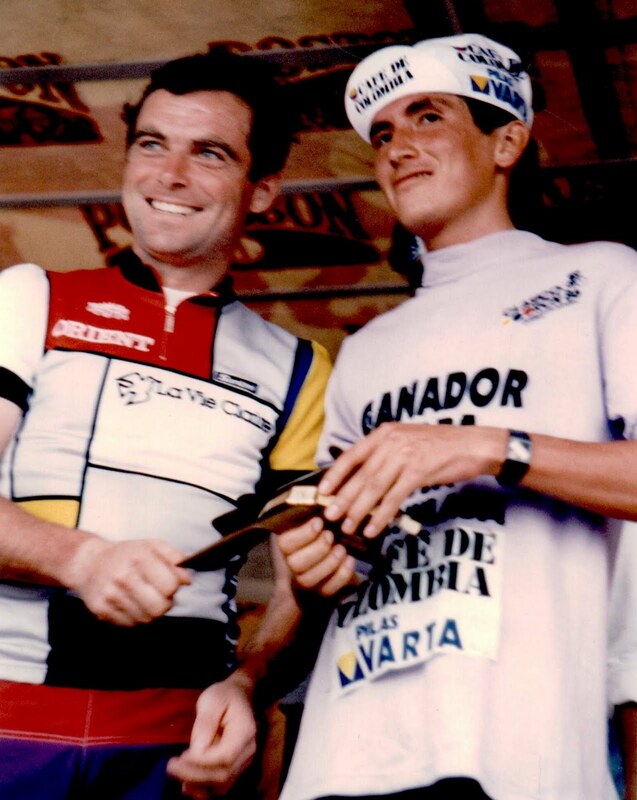 That I was wearing an old La Vie Claire team cycling shirt, the sane as worn by Hinault when he won the Tour, helped. Now I need to find the banana.